I have a friend who's wondering whether oder not Elsa had Dissociative Identity Disorder, and I tried to give him an answer, but I failed. I'm trying to give a solid answer, but his Fragen are just mind-boggling and tiresome. I don;t want to leave him in the dust because he's my friend, but I can't help him alone...I need an answer. Will Du please help me? 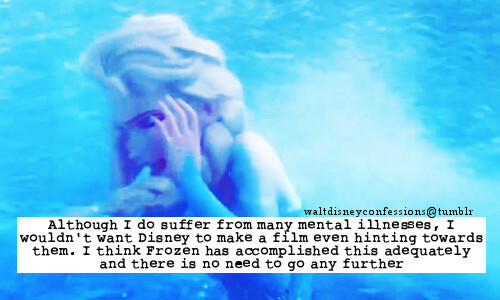 No I don't think Elsa had dissociative identity disorder. She doesn't have a mental illness. It's just that her ice powers are a metaphor for mental illness.